Morrissey's show in Boulder was canceled last night after keyboardist Gustavo Manzur fell ill. Morrissey initially came on stage and told fans that the show would be delayed, explaining "We can't move until we know what’s happened to him...We're going to sit backstage for awhile and wait to see what's happened to him, if there’s any magical cure." Not long afterwards Jesse Tobias came back out to apologize and officially cancel the show. According to an update on True To You Manzur collapsed and was hospitalized prior to the Boulder show and he's now in the hospital recuperating. According to the official statement, he'll need to rest for a week, but "Gustavo and the band are determined to make the shows at Detroit, Cleveland and Chicago." So far they haven't announced whether Morrissey will enlist the help of another keyboardist in the meantime, or axe a week's worth of shows. As it stands now, the tour is scheduled to resume in Dallas tomorrow night. 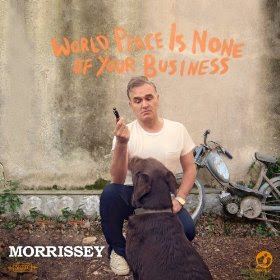 UPDATE (11/15 @ 6:00) Morrissey has now canceled shows in Dallas, San Antonio, and Houston. The tour is set to resume November 23rd at the Royal Oak Music Theatre. "Gustavo Manzur collapsed and was hospitalized two hours before the band were due on stage at Boulder in Colorado. Morrissey made an on stage announcement and the sell-out crowd were greatly understanding and supportive. Gustavo is recuperating today. Doctors have advised one week of rest. Gustavo and the band are determined to make the shows at Detroit, Cleveland and Chicago."